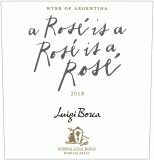 Terroir: Sourced from Bosca’s Finca Don Leoncio estate at 780 meters within the Maipu subregion of Mendoza. Weather is dry throughout the growing season with hot days and cool nights. Vines are 10 years old on average. Vinification: Syrah is macerated at cool temperatures for 1-3 days extracting flavor and color. The Pinot Gris will rest on it’s skins for a slightly longer period. The wine is fermented and aged exclusively in temperature controlled tanks prior to bottling. A refreshing, delicate and seductive rosé with a pale, salmon color reminiscent of the classic rosés of southern France.